The BAPS Shri Swaminarayan Mandir is considered one of the largest Hindu temples in the world. The temple is made entirely of Carrara marble imported from Italy to Rajasthan, India, where hundreds of artisans began hand-carving the stone. 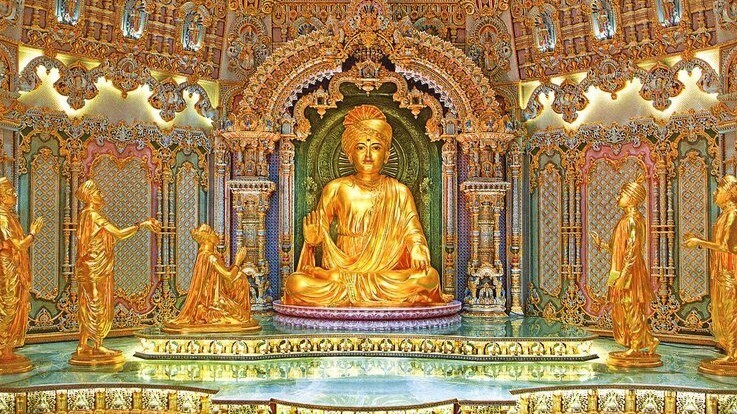 The finished mandir, which opened in 2014, is an awe-inspiring work of craftsmanship. Join fellow TTN members for the opportunity to enjoy hours of beauty, peace and discovery at a masterpiece of exquisite Indian design and workmanship. You will marvel at the intricate marble carvings, participate in Hindu rituals and learn about the world’s oldest living faith – Hinduism. Your visit will consist of a short welcome and introductory address, a video presentation of the history and construction of the Mandir. Our guided tour will allow us to participate in Hindu rituals such as the Abhishek, which is the ancient practice of pouring water over an image of God to ask for blessings, and experiencing the sacred midday musical prayer, which many visitors say is awe-inspiring. After registering, please contact Cate Silver <csilver0313@gmail.com> if you are interested in carpooling and/or joining the group for lunch after the tour. *Note: Photos are not permitted inside the temple. Dress code: back, shoulders, upper arms are to be covered, as well as legs to below the knee. Registration, payments and cancellations* must be made by April 11, 2019. *No refunds will be given after this date.